I Ching hexagrams are the actual recordings of I Ching coin tosses or yarrow stick castings that are performed during a divination reading. This ancient Chinese divination system is used to predict the future, gain insight into current issues and discover hidden issues that may be affecting the chi energy in your life and home. Exactly when the divination form of I Ching was first started is obscured in an ancient culture known for closely guarding its mystical secrets. In fact, some believe that I Ching was first used around 1,000 BC during the Zhou Dynasty, Other historians argue that the date is much older, dating back to 5,000 BC. The age of the divination system isn't as important as the fact that it's been used for all those centuries and is still a significant part of the Chinese culture. Some traditional and classic feng shui practitioners use the I Ching in their analysis processes, especially when there are extreme fluctuations in various sectors of a person's life. For example, if you have a sudden reversal in fortune or your career takes a nosedive, then a feng shui practitioner might use the I Ching to take a reading on you and your house. This tool will give her/him a clearer understanding of any possible underlying issues that have escaped your notice. This is an especially helpful tool when conventional feng shui cures or remedies don't seem quite powerful enough to address known issues. You will toss three coins six times. Take the three coins and toss them. Each toss is recorded to reflect the number of times the coins land either as heads or tails. These are used to create a Hexagram. This is six lines stacked on top of each other. 3 tails (yin): Draw a line broken in the center and place an X in the space between the broken line. 3 heads (yang): Draw a solid line with a circle (zero) in the center of the solid line. 2 heads and 1 tail (yin): Draw a line broken in the center. 1 head and 2 tails (yang): Draw a solid line. A few quick steps can help you create the hexagram for your coin toss. As you record the coins, you will form the hexagram and then use the I Ching to interpret its meaning. When you record each coin toss, it's very important that you record the first toss to form the base of your hexagram and build upward. That means your first coin toss will be THE bottom line of the completed hexagram. Place the second coin toss recording on top of the first one. This may be a solid bar or a broken bar depending on the coin toss. 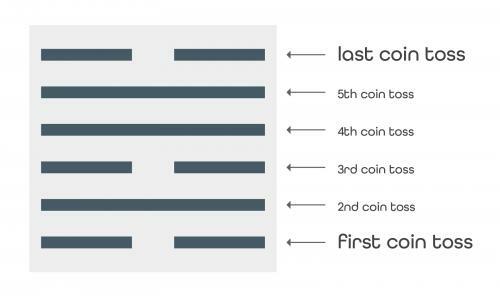 You will stack the next bar onto the second one according to the coin toss results. Continue stacking the coin toss bar on top of the previous one until you have a total of six lines stacked on top of each other. You have created a hexagram. The hexagram can also be divided into two trigrams for more in-depth interpretation by a feng shui practitioner. The bottom three bars create the first trigram and the top three bars form the upper trigram. When you toss the coins and you end up with either three tails or three heads, these are considered changing coins. 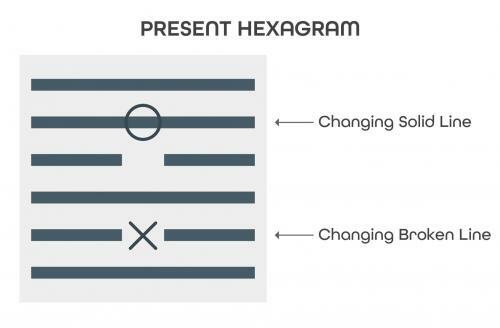 That means you will not only read the meaning for the hexagram they are part of that represent the present circumstances, but you'll also read for a future meaning. To distinguish them from the other two combinations of 2 heads and 1 tail, and 2 tails and 1 head, the X and O are inserted to remind you that line needs to be changed so you can do a future reading. 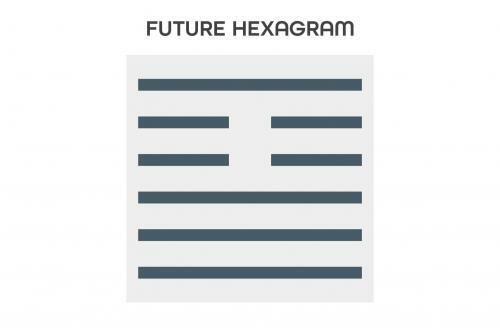 To create the future hexagram, you will create a hexagram by changing the three heads and/or three coins. To accomplish this change is simple. Change the 3 tails' broken line to a solid line. Leave out the X. This represents the future. 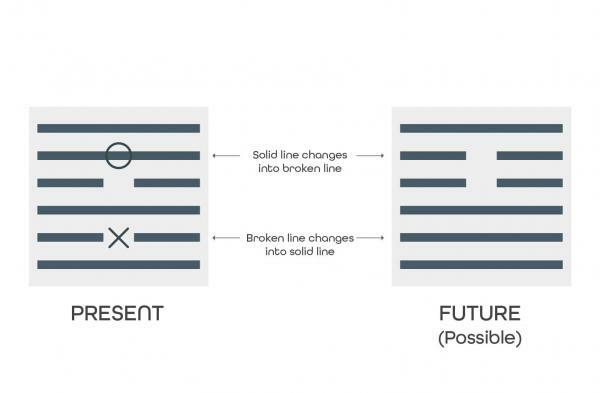 Change the 3 heads' solid line to a solid line. Leave out the circle (zero). This represents the future. Just as with any form of divination, I Ching has set guidelines for interpretation. To fully understand the hexagram, it helps to know what area of your life each of the six lines represent. Line one (bottom line): The crux of your question that reveals the basic concern or issue. Line two: Reveals what is changing about your situation or circumstances and whether your basic question or problem can be supported. Line three: Things that can affect your circumstances, such as personal weaknesses and strengths as well as the challenges you must face to obtain the outcome you desire. Line four: Other people's influence over your circumstances and how the first three lines combine to influence this line's position. Line five: Unforeseen events or circumstances that can change your situation or reveals what is controlling your situation. Line six (top line): The situation isn't balanced and has too much yin or yang energy and how you can rectify your circumstances or situation. The I Ching, also known as the Book of Changes, has 64 interpretations of the I Ching. Some other ancient texts are said to have 128 or even 356 possible interpretations. The one most used is the I Ching that gives 64 short stories that are often very difficult to understand in their original context. Fortunately, the metaphoric nature of these essays has been translated into modern language and understanding. It's easy to understand how a feng shui practitioner can employ the use of this ancient divination tool to assist in especially difficult analysis of homes with hidden energy issues. This is typically easy to recognize when traditional and standard remedies don't seem to have an effect on the sha chi (negative energy) in a home or business. Under such circumstances, the I Ching hexagrams assist the feng shui practitioner in finding the underlying issue. Often the issue(s) revealed is hidden and is blocking chi energy from flowing freely throughout your home or business. 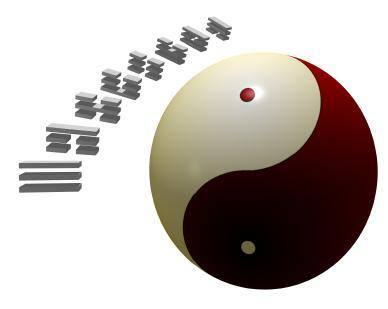 As with all things feng shui, I Ching is governed by the same principles of chi energy, which is composed of yin (female) and yang (male) energies. Together, the yin and yang energies create a balanced whole. By using I Ching, a feng shui practitioner can help you find ways to restore a balance between yin and yang energies in your home or office. This is similar to the way I Ching is used to create personal and inner restoration. The coins have an assigned yin or yang energy value. While the I Ching and hexagrams are a complex system of divination, building a hexagram can be as simple as tossing three coins or yarrow sticks. You don't have to master the I Ching in order to use it to help you in your feng shui design and applications.